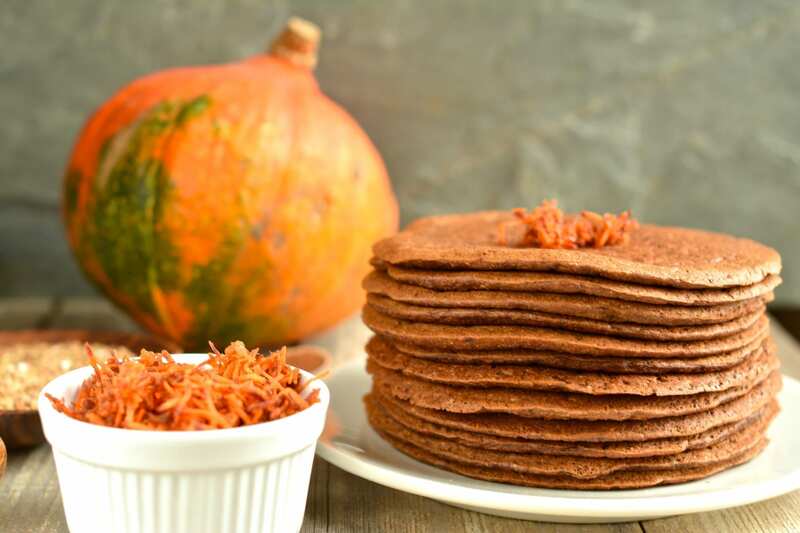 For many of you pancakes are probably a must-have on Sunday mornings, even if you are on Candida diet, like myself. 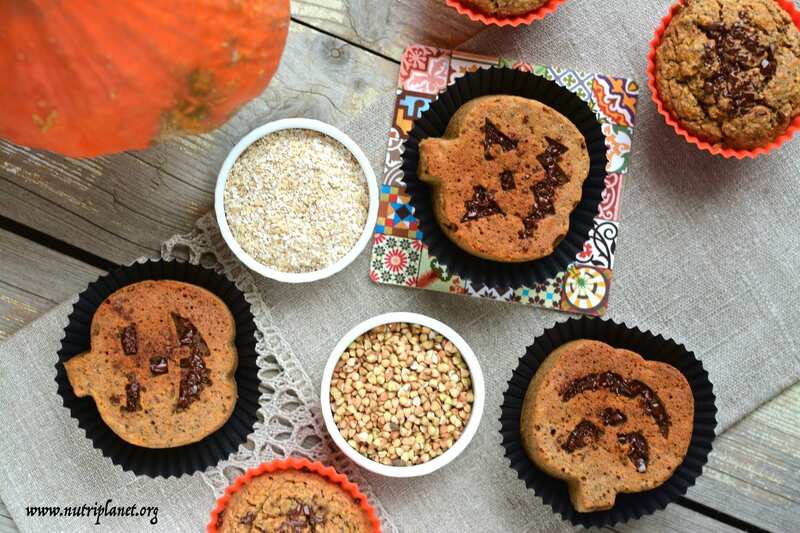 The good news is that you don’t have to give up the comforting traditions just because you have dietary restrictions or simply want to be healthy. 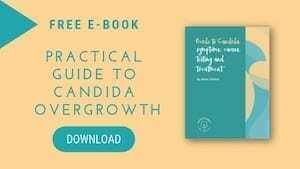 After starting the vegan Candida diet, I realized how much grains I used to eat and how easy it was to actually over-eat them causing the glycemic load of my food to rise too high. That’s why I started to explore this topic a bit deeper and began to make adjustments that my health would benefit from. For example, buckwheat has 37 GL points in 100 grams, whereas oat bran only has 16. So, I substituted half of the buckwheat with oat bran in my pancake recipes. Furthermore, to get more pancakes from the same amount of batter allowing me to eat more of them at a time, I added a fair amount of grated raw veggies, which on top of it all make the pancakes pleasingly moist. So, it’s a win-win. Besides, my family just loves them! Especially my kid is happy because the pancakes are heavier and he get’s to consume more. 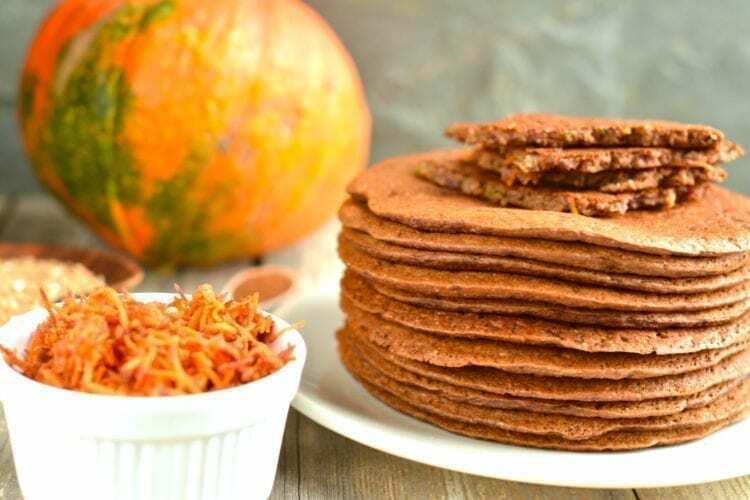 It is the time of the year when it’s cold and dark outside and I need to consume food that comforts me and offers heat, so I spiced those pancakes up with the traditional winter spices – cloves, cardamom, nutmeg, ginger and cinnamon. 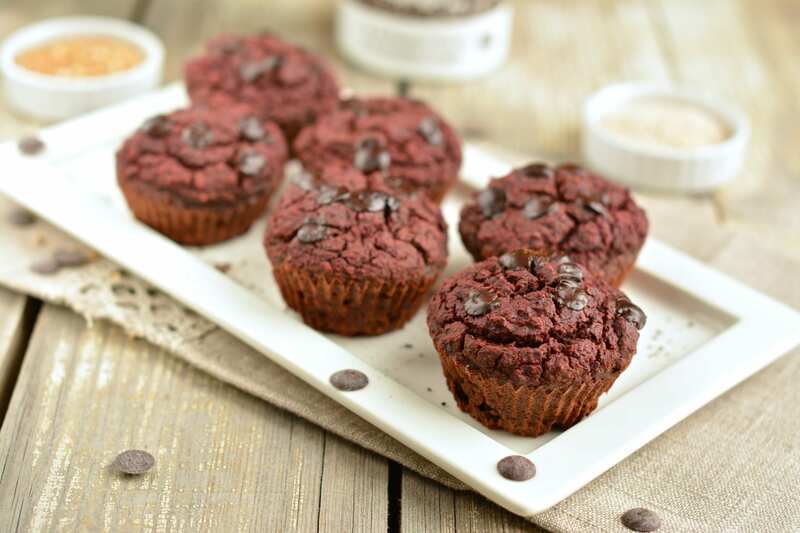 Sometimes it feels as if I was living off those spices – not a day goes by without a fair amount of them sprinkled on or stirred in my porridge, chia pudding, drinks, cookies and cakes. 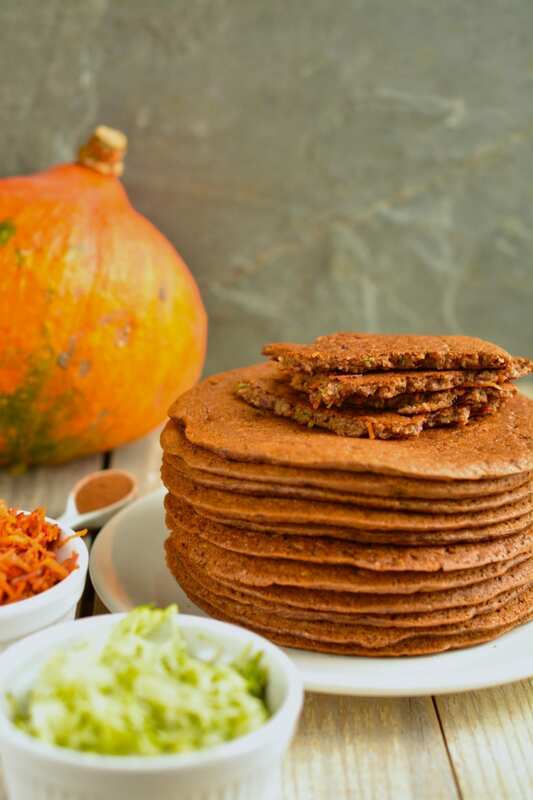 To keep things short for those not keen on reading long posts, my fluffy and spiced squash-carrot pancakes with buckwheat and oat bran are Candida diet friendly, plant-based, vegan, sugar-free and oil-free. One might claim them to be gluten-free as well, but there’s a debate on avenin in oats – some people with celiac disease can tolerate gluten from uncontaminated oat products, but others react with an autoimmune response. Should you be one of those people, substitute oat bran with rice bran. Add the rinsed groats along with other ingredients, EXCEPT grated veggies, into blender and blend until smooth and homogeneous batter forms. Taste and adjust by adding more spices/salt if necessary. Finally mix in finely grated veggies. Take a good non-stick pan free of Teflon and PFOA (Perfluorooctanoic Acid). Add a few drops of oil onto the pan and swipe it off with folded kitchen paper. Let all the oil absorb into the paper and use it to swipe the pan clean between pancakes. Put a ladleful of batter onto the pan and even it out with a spoon or by shaking and/or tilting the pan to get the exact shape of your pan bottom. The frying time greatly depends on your stove. I flip it around when it is almost dry and also check the colour of the bottom side. Unsweetened applesauce makes a great pancake jam, especially if you add a splash of coconut milk. Hummus with salad would also make a great addition to these pancakes. As I’m on Candida diet, I just have them plain with chicory root coffee. I really don’t miss any toppings, because the pancakes are so fluffy and moist from the veggies hidden inside them. I even like to have them instead of bread as a side to my lunch or dinner. You can also play with the veggies – if you don’t have butternut squash, sub it with carrots and vice versa.